Following my previous post, here I’ll write about some science policy-related talks, events, and news at the American Astronomical Society meeting two weeks ago. As we saw in President Obama’s State of the Union address on Tuesday, NASA’s sending Scott Kelly to join Mikhail Kornienko for a 1-year mission at the International Space Station, where they and their crewmates will carry out numerous research experiments and work on technology development. This could help toward sending manned missions to Mars in the future, which would involve much longer periods in space. Of course, actually getting to Mars involves many other challenges too; and let’s remember that the ISS has an orbit height of about 431 km while the closest distance between Earth and Mars is 54.6 million km–about 100,000 times further away. Reaching Mars is clearly an ambitious goal, but it’s achievable in the long term. (For SOTU coverage, check out these articles in Science and Universe Today.) The new budget extends the life of the ISS until at least 2024, “which is essential to achieving the goals of sending humans to deep space destinations and returning benefits to humanity through research and technology development.” The ISS accounts for most of NASA’s space operations budget, but that only accounts for a few percent of NASA’s total budget, which includes many other activities and missions. The NASA Town Hall began with with an update on its budget for 2015, and if you’re interested in the details, take a look at my previous post. One important change is that education will not take up 1% of every project as before; instead, the new budget requires that educational activities be centralized in the Science Mission Directorate (SMD). The National Academies, which include the National Academy of Sciences, organize a massive effort every decade for leaders in the astronomy and astrophysics community to prioritize their goals and challenges and to make recommendations about what kinds of large-, medium-, and small-scale projects should have funding and resources invested in them. The Decadal Survey for 2010-2020, “New Worlds, New Horizons in Astronomy and Astrophysics”, is detailed and well-organized, and you can view it online. It’s complementary to the European Space Agency’s (ESA) “Cosmic Visions” programme for 2015-2025. Astronomers have produced these surveys since the 1970s, and other fields are catching on too; for example, the 2015-2025 decadal survey of ocean sciences just came out today. 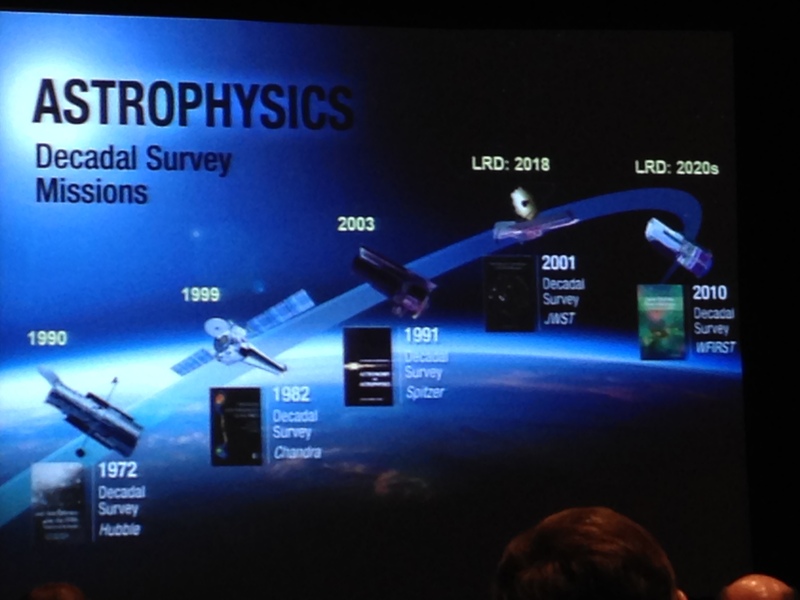 The NASA spokesperson pointed out that previous Decadal Survey missions—Hubble, Chandra, and Spitzer—have now become household names, and the James Webb Space Telescope and Wide Field Infrared Survey Telescope will too. JWST will be great for astronomy and for outreach, but it is nonetheless extremely expensive and over budget, which implies that some smaller projects won’t be funded. 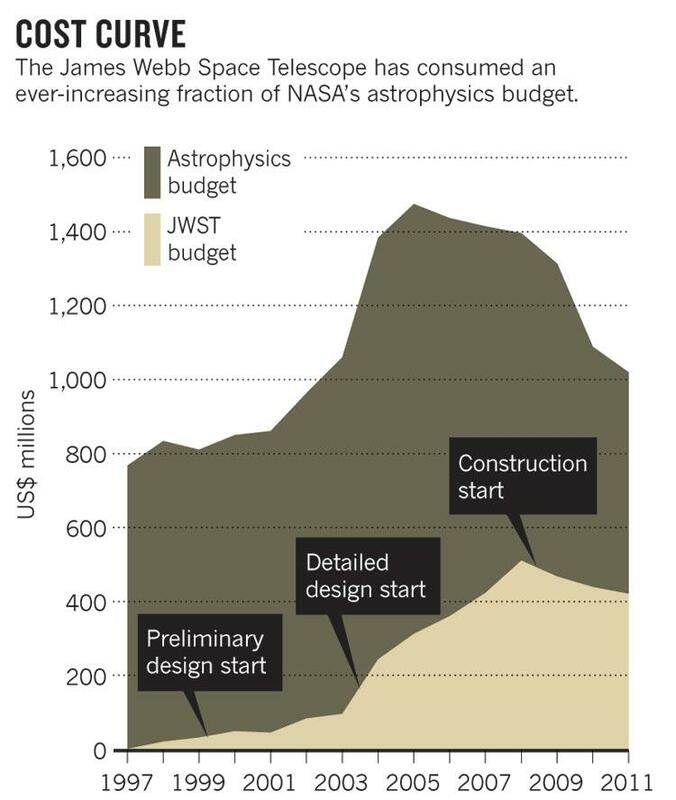 According to this detailed article by Lee Billings, JWST is taking an ever-increasing fraction of NASA’s astrophysics budget, and based on the presentation at the town hall, it looks like that will continue for the next few years. In the meantime, WFIRST’s budget will start ramping up soon too. In other news, at the AAS meeting we also heard updates about research grants in 2014 through NASA’s funding of Research Opportunities in Space and Earth Sciences (ROSES) funding. The Astrophysics Data Analysis Program (ADAP) was funded at $7.5M last year with a 21% proposal success rate, and the Astrophysics Theory Program (ATP) was funded at $3.5M with a 11% success rate. I didn’t catch the stats for the other programs, such as those involving exoplanet research and instrumentation. Grant funding levels have been pretty flat for the past four fiscal years, but because of the increasing number proposals, the selection rate keeps decreasing. Theoretical astrophysicists will be dismayed that no ATP proposals will be solicited in 2015, but they say that there has been no reduction in funding, just a delay. There were also interesting sessions about education and public outreach (E/PO) and Program Analysis Groups (PAGs) too, and I suggest checking out those links if you want more information and resources. I also attended the NSF town hall, and similar to the NASA one, was primarily about budget issues. The NSF budget fared alright for fiscal year 2015 and appears to be between the pessimistic and optimistic scenarios they envisioned. NSF is pursuing partnerships with universities, other institutions, and federal agencies on some projects, such as a NASA-NSF partnership on exoplanet research. NSF analysts expect an approximately flat budget out to 2019, but that could change. They’re already preparing for FY 2016, and the President’s Budget Request will come out in the near future. For the division of astronomical sciences (AST), NSF research grant proposals had a success rate of 15-16% for both 2013 and 2014. Nonetheless, as with NASA, there appears to be a long-term decreasing trend; in 2002, the success rate was 38%. And as with NASA, this is mostly due to increasing numbers of proposals, and they’re starting to restrict the number of proposals submitted per investigator and per institution. They’re also developing strategies in case success rates drop below 10%, which would be a dire situation. I’ve been funded by NSF grants myself, and it’s stressful for faculty, research scientists, and grad students when proposals are rejected so often. The NSF spokesperson briefly mentioned NSF “rotator” positions, which are temporary program directors who work at the NSF and collaborate with many people on a variety of policy and budget issues. The astronomical sciences has such a program, and if you want more information about it, look here. The NSF also funds major telescopes, including the Atacama Large Millimeter Array (ALMA) in Chile, the Daniel K. Inouye Solar Telescope (DKIST) in Hawaii, and the Large Synoptic Survey Telescope (LSST), also in Chile. As you may know, scientists are making progress with ALMA and have obtained interesting results already (see below). DKIST is under construction, and construction will begin on LSST later this year. In NSF’s budget, existing facilities account for about 1/3 of it, individual and mid-scale programs are another third, and the rest of the budget goes to ALMA, DKIST, and LSST. Joel Parriott, the AAS’s director of public policy, and Josh Shiode, the public policy fellow, organized a great session on science policy and the AAS’s advocacy efforts. They gave an informative presentation about how budgets are determined and about the current budget situation for basic and applied research in the astronomical sciences. I didn’t know that the US currently funds 37% of the world’s R&D, but China is expected to overtake the US in the early 2020s. Shiode also spoke about the importance of cross-cultural communication between scientists and policy-makers. 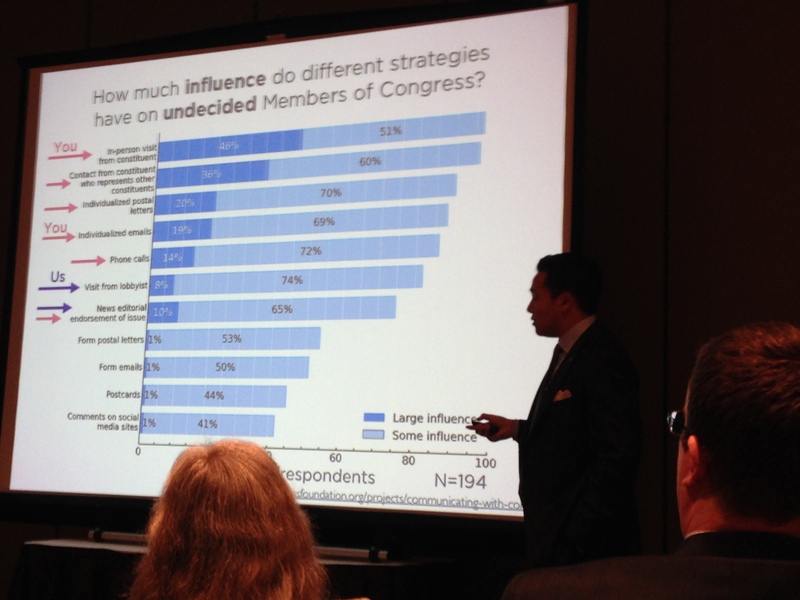 As a scientist and as a constituent, there are many ways that you can influence your Congress members, and nothing beats interacting with them in person. If you’re an astronomer, I strongly encourage you to participate in the Congressional Visits Day. I participated in it last year (see my blog post about it), and I really enjoyed it. You can find more information here, and note the deadline on 3 February. There are other ways to get involves as well. You can also call or write to your Representative or Senators as well as write letters to the editor or op-eds for your local newspaper. Note that some Congress members will be receptive to different messages or to different ways of framing scientists’ and educators’ concerns. One concern scientists have these days is that some members of Congress are interfering with the peer-review process in the NSF and NIH. Al Wootten (National Radio Astronomy Observatory) gave a nice talk about science that is being done with ALMA so far. It’s an array of 66 12-meter and 7-meter radio telescopes, and after three decades of planning/construction, ALMA is now approaching full science operations. The US is part of a large international collaboration consisting of a partnership between North America, Europe, and East Asia. Wootten presented interesting results about observations of gas in Milky Way-like galaxies in the distant universe and of gas kinematics in protostars and protoplanetary disks. ALMA had a conference in Tokyo in December, and the proceedings will be published in a few months. The TMT and JWST are upcoming telescopes that much of the astronomical community and the science-loving public are looking forward to. The TMT is one of the giant telescopes I’ve written about before, and it will have “first light” in 2022. JWST is scheduled to launch in 2018. Relevant to some of the issues here, the National Research Council just published a report, “Optimizing the U.S. Ground-Based Optical and Infrared Astronomy System,” which is mainly about how the astronomical community can coordinate science priorities in the era of the LSST and giant telescopes. One can access the report here.